What can I say? I love new ideas and this took a risky move and knocked it out of the park! Card games on motorcycles sounds... sounds every bit as stupid as you may think but... it works. this is the point where the yugioh franchise takes the next leap for their animations. Normally they would have two characters standing opposite each other with lines or still frame at the background but this anime actually shows movement in ways you never seen before. I love the series (Mainly series 2), Yusei is lovable, animation is fun to watch and almost all the cards does exactly what it says in the trading card game so the audience knows what to look for if they want it. Sadly this is obviously targeted for kids but I still enjoyed it and it is suitable for kids and young adults. If you love yugioh as a kid you'll love this. Ah, 5Ds, how silly but awesome your concept was. I'll be honest, the first time I heard about it, I thought it was totally awesome. I mean, it's Card Games on Motorcycles, and I was in 5th grade. I loved Yu-Gi-Oh, and I loved motorcycles. And OH MY GOOOOOOOOOOD!!!!! !, it delivered. The concept works, and was greatly entertaining. The characters were interesting, and much more mature in tone, which is both interesting for a series involving saving the world with a trading card game. The whole crew is awesome, and much like the entire series, so strongly written. Honestly, I just say you just watch it, stop reading my review and go and watch it for yourself. The music is good stuff, the characters are nice, the story is good, the duels are thought out well, and the writing is the best in the series compared to the last 2 series. Go, OFF WITH YOU, go give it a watch. Now that all 154 episodes are available subbed, everyone should take a chance and watch this series. The thing is, once you take out the "duels" 5D's has one of the more stronger and cohesive plots than the other series. Where Season 1 was an introduction into the world of the Turbo Duel and into the darkness with the Dark Signers, Season 2 delves into a dystopian future and reveals the origin of Paradox and what his mission was really about. All the time maintaining the bonds of friendship and never losing hope. The English dub stopped after combining episodes 135-137 so now that the entire series is up please take a chance and watch the rest! Out of the first 3 yugioh series so far I cant decide which one I love more, whether it's the original or 5d's, somehow I want to believe 5d's has a better storyline than the previous 2 I do think the original had an epic start and ending but 5d's ending is probably the best (japanese anyway) Never mind the duel runners or motorcycles,by the second season you will come to enjoy it and they dont take anything away from the duels. 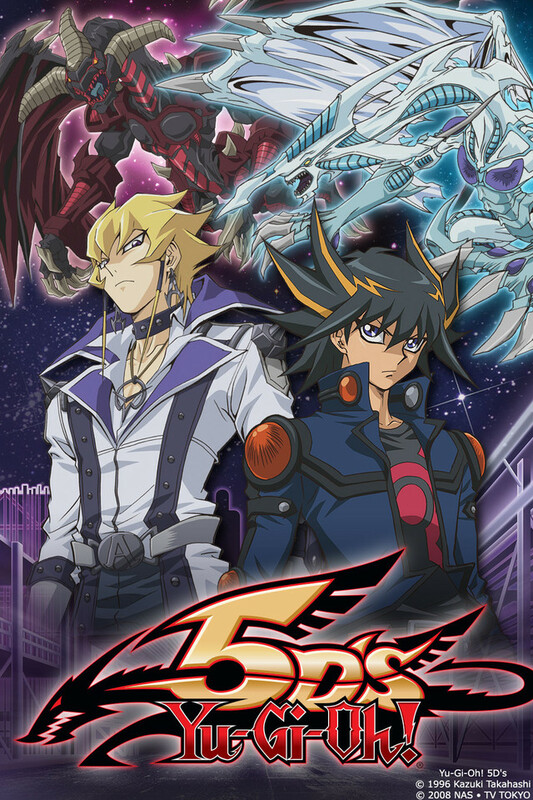 More mature than gx though not as funny.Faster Progression, Decent character development, ok visuals (for it's time anyway) the duels will keep your adrenaline levels to the max, definitely worth the watch. When I first heard about 5D's back in late 2008, I didn't care for it, but years later, I really started to like it and it became my favourite spinoff in the franchise. The characters are well developed and the acting (in the Japanese version) is top notch. Now most people hate the 4Kids dub because of dialogue edits, cuts, edits and background music replacements and that both the GX and 5D's dubs were incomplete. And I agree about that. The dub is inaccurate, but if you don't like the dub, you can just watch the original Japanese version with subtitles. And are now recently complete. And to be honest, the official subs are decent. Not perfect, but decent. A few gripes here and there are the TCG names for the cards being used in the subs instead of the Japanese card names. But of course that's because of legal reasons. I did like the fansubs before this, but as said before, the official subs are OK and are close to the original script aside from a few nitpicks. Also, for the subs, the episodes used are based on the Japanese DVD versions of the episodes. Except for episodes 2, 3, 19, 39, 65, 70 and 143 which used the original broadcast versions. And for the final episode, it's the DVD version, but the ending is from the original broadcast as I did a 5D's DVD Edits topic a few years ago on a Yu-Gi-Oh! forum called Neo Ark Cradle. So give 5D's a shot if you haven't already. I highly recommend it. Card Games on Motorcycles? Yes please! When 5D's was first announced to be dueling on motorcycles I immediately jumped on the haters wagon thinking that Yugioh was finished and vowing to never watch such a ridiculous concept. This however turned out to be to my benefit, because when I did finally decide to at least try the first 3 episodes (as I do with any anime) there were already 26 episodes released. I ended up marathoning all 26 over the course of 3 days and began eagerly awaiting the next. Unlike its predecessors and following series, 5D's has a very mature feel. Yusei our main protagonist is easily the most serious protagonist at the start of any Yugioh series, and with good reason. Not only is he the oldest protagonist ever, his back story is also easily the most tragic and the life he has had to live was a rough one. Not just Yusei however, most of the supporting cast have complicated stories as well. Turbo Dueling was handled very well by the writers creating a fresh, new, exciting to watch spectacle. I was seriously astounded by how much I enjoyed the turbo duels by episode 25. And the story itself takes place in the real world with adults who have jobs and real world problems. Also in my opinion the soundtrack for 5D's is easily the best out of any Yugioh series, honestly I never thought I could get so pumped to see a man on a motorcycle summon a dragon. In conclusion 5D's does suffer from a few plot holes, occasional repetitiveness here and there with the duels and a cancer inducing 4Kids Dub. However it's dark story line and setting as well as very likable characters and amazing soundtrack make it worth a try in my opinion. So set Speed World on, engage Duel Mode and sit back for an enjoyable ride. Riding Duel Acceleration! I love duelrunners and Yusei and stardust dragon. He is my shrek, period. I would travel to universe and back if i could live in that world. Best yugioh in the series 10/10 would do. Jack Atlas is pretty cool, but not as cool as Yusei cause Stardust Dragon and other various junk monsters. A radical change from the kinda childish tone of the previous series, this series protagonist's back story is perhaps the most tragic out of the 5 series 'til now. Remove the card game scenes and you've got yourself quite an interesting story mixing ancient magic and futuristic races, and once you get to know all the main characters stories you can't help but wonder if this is still a kids show. Seriously it's stupid how much love I have for this series and it's characters. Rivaling that of the original series and my other favorite GX this one sits at the top. While the idea of card games on motorcycles sounds ridiculous it adds another feature to the fandom that wasn't offered and expands peoples interest beyond just regular dueling. All in all it was a worthy gamble. When I first started to watch this series my only reason for doing so was to pass time and I had heard that this was one of the worst parts of Yu-Gi-Oh!. To my amusement this quickly became one of my favorite parts of the whole series, I loved how human the characters felt and that every battle felt exciting. might get some backlash for this but I chose to watch the dub, as I said at the start of this review, I only started watching it to pass the time and I heard that the dub was really badly done, so to entertain myself just a bit more i chose the dub over the sub. While i don't know if that was the best way to watch the series I still loved it through and through. I do hope that something of this quality will come out again.